Nike teamed with London rapper Tinie Tempah and his clothing line ‘Disturbing London’ to create a special edition of their Nike Blazer trainers. Tinie himself wore the trainers for his performance at Radio 1’s Hackney Weekend. 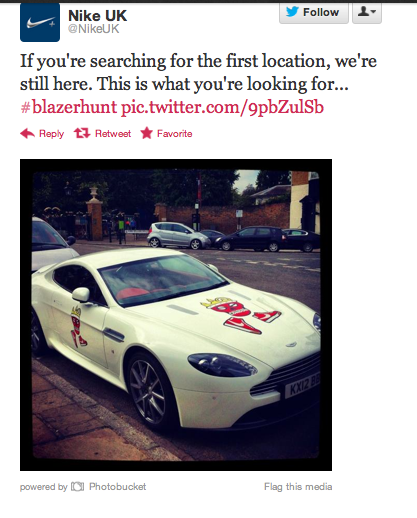 The Scavenger hunt was launched today, using the hashtag #blazerhunt. Clues were tweeted giving hints to 6 locations around London. Whoever was fastest to the locations would get one of only 60 pairs made. Tweets were sent from Tinie’s official twitter @TinieTempah, whilst @NikeUK & @disturbingLDN retweeted too. Not only is this great PR for Nike (like they need it!) but teaming up with a popular musician with thousands of followers, a lot of influence and offering exclusive trainers for free that Tinie (and other celebs) have actually worn make the trainers even more desirable. This ensures that fans actually went out to search for the secret location. From Tinie’s perspective, his perhaps not very well known clothing line has gained great publicity through the partnership and he is showing his fans he cares about them, likes to have fun and has taken time out to give something back. Win win for Nike, Disturbing London and Tinie! And the fans were grateful indeed, they tweeted about their prize here and here and here and here and here !